Residential Landlords or their Agents must ensure that gas installations, appliances, fittings and flues provided for tenants are safe. In addition, Tenants also have certain legal obligations when it comes to safety. In the case of residential properties, Landlords (or their agents) have a statutory duty to arrange annual Gas Safety Checks by a registered Gas Safe installer. Furthermore, a copy of the Landlord’s safety certificate must be given to the tenant on entry. Hence a copy must also be retained by the landlord for 2 years. There are severe penalties for non-compliance. Deaths could result in manslaughter charges for landlords and agents. Therefore, non compliance is a criminal offence and courts can impose unlimited fines and custodial sentences. Consequently, it may also invalidate your property insurance and lead to claims for civil damages. We can arrange checks on behalf of Landlords by our retained Gas Safe registered engineers. Implement a system of annual checks and maintenance for all appliances and flues. Use only Gas Safe registered engineers for installations, maintenance and safety checks. In addition, maintain safety check records, keeping copies for at least 2 years, and issuing copies to each tenant within 28 days. On re-letting, remove any suspect appliances from previous tenants. 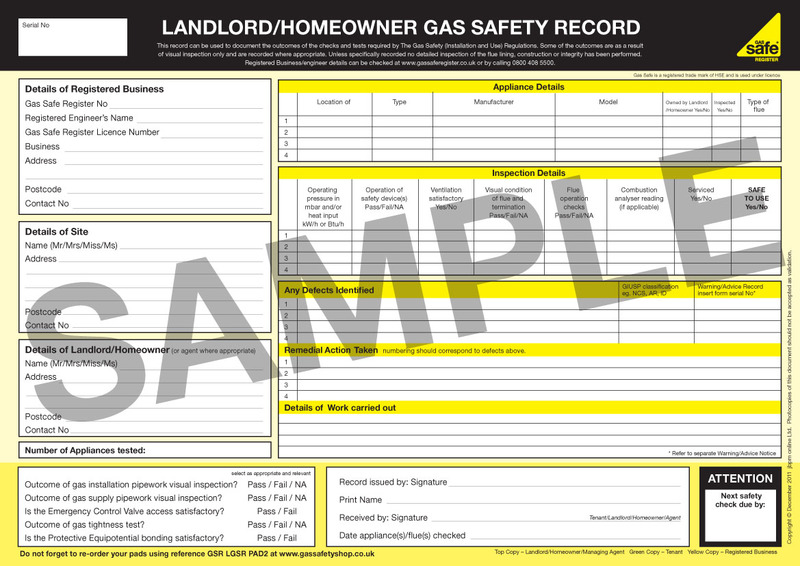 Issue the new tenant/s with a copy of the safety check record on entry. Furthermore, visually inspect the installation and appliances. Work closely with tenants in gaining access for maintenance, repairs, safety checks and the early reporting of faulty appliances. If you experience difficulties gaining access make sure you fully document this to show you have taken all reasonable steps. Water heaters must have fail safe thermostats fitted. Most noteworthy, Tenants also have responsibilities imposed upon them by the safety regulations. Landlords should inform tenants of this fact in writing and should include a clause to this effect in the tenancy agreement. Under no circumstances must tenants carry out DIY work on installations and appliances. Tenants should inform the landlord or managing agent immediately if they know or suspect a gas system to be unsafe. It is a criminal offence to knowingly use an unsafe appliance. In an emergency the tenant should turn off the gas at the main cut-off valve and inform TRANSCO immediately on 0800 111 999.